Schematic representation of the NMDA receptor complex. NMDA receptor antagonists can have beneficial effects in animal models of stroke, but also have pronounced side effects such as disorientation and hallucinations. In the 1990s, neuroscientists identified a class of drugs that showed promise in the area of stroke. NMDA receptor antagonists could limit damage to the brain in animal models of stroke. But one problem complicated testing the drugs in a clinical setting: the side effects included disorientation and hallucinations. Now researchers have found a potential path around this obstacle. The results were published in Neuron. "We have found neuroprotective compounds that can limit damage to the brain during ischemia associated with stroke and other brain injuries, but have minimal side effects," says senior author Stephen Traynelis, PhD, professor of pharmacology at Emory University School of Medicine. "These compounds are most active when the pH is lowered by biochemical processes associated with injury of the surrounding tissue. This is a proof of concept study that shows this mechanism of action could potentially be exploited clinically in several conditions, such as stroke, traumatic brain injury and subarachnoid hemorrhage." In a mouse model of ischemic stroke, a NMDA receptor antagonist called 93-31 can reduce the volume of damaged brain tissue by more than half, researchers found. At the same time, giving mice 93-31 does not seem to lead to the side effects seen with other NMDA receptor antagonists. The drugs phencyclidine (also known as PCP) and ketamine are NMDA receptor antagonists; their ability to block all subtypes of NMDA receptors is thought to account for their psychoactive side effects. NMDA receptors are abundant on the surfaces of brain cells and play key roles in healthy processes such as memory formation. In brain tissue affected by stroke or traumatic injury, the environment becomes more acidic because of the lack of oxygen and the buildup of metabolites such as lactic acid. 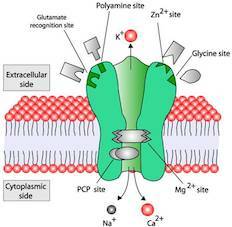 In addition, NMDA receptors get overstimulated by an increase in the neurotransmitter glutamate -- enough to kill cells. Researchers reasoned that NMDA receptor antagonists whose activity is dependent on acidic conditions should, at the right dose, be active only in the injured areas of the brain. To identify the new pH-dependent drugs, Emory pharmacologists led by Traynelis and Ray Dingledine, PhD collaborated with chemists Dennis Liotta, PhD and James Snyder, PhD. The co-first authors of the Neuron paper are pharmacology instructor Hongjie Yuan PhD, chemistry postdoctoral fellow Gordon Wells, PhD and Scott Myers, PhD, director of drug discovery at Atlanta-based pharmaceutical company NeurOp. In medicinal chemistry terms, 93-31 is ten times more potent at pH 6.9, typical for ischemic tissue with an insufficient blood supply, than at pH 7.6, close to the value for healthy brain tissue. In collaboration with Katherine Nicholson, PhD at Virginia Commonwealth University, the researchers tested 93-31 on mice trained to press a lever when they detect low levels of PCP. When researchers substituted 93-31 for PCP, the mice did not perceive 93-31’s subjective effects to be similar enough to PCP’s to respond by pressing levers in the same way. Doses of 93-31 that had a positive effect in the stroke model did not seem to impair coordination or motor function. The mice could still hold onto a turning rod, in contrast with mice dosed with other NMDA receptor antagonists. The research that led to 93-31’s identification has been a platform for further drug discovery efforts by NeurOp, according to the company’s CEO, Barney Koszalka, PhD. However, 93-31’s pharmaceutical profile may not be optimal for further development, he says. In mouse experiments in the Neuron paper, 93-31 was either injected directly into the brain or into the body cavity. NeurOp is developing a related candidate drug as a potential preventive measure for people who experience subarachnoid hemorrhage, because they have a high risk of a secondary stroke-like event for days after the initial hemorrhage. NeurOp is completing safety studies and is planning to file an Investigational New Drug application with the FDA later in 2015. "We are taking an analogue of the compound identified in the Neuron paper forward as a post-surgical treatment for individuals that have suffered a subarachnoid hemorrhage," Koszalka says. "The pH boost we see with this series of subunit specific NMDA modulators is expected to provide an additional safety advantage." The research was supported by the National Institute of Neurological Disorders and Stroke (NS036654, NS036604) and by the Advanced Technology Development Center and EmTech Bio. Disclosures: Traynelis is a co-founder of NeurOp, and a paid consultant for NeurOp Liotta is a member of the Board of Directors for NeurOp, and Myers is a current employee of NeurOp. Emory University, and Liotta, Snyder and Traynelis, hold an equity position in NeurOp. They are co-inventors on patented and patent pending technology licensed to NeurOp.